Brief Synopsis – Biopic of the notorious gangster Baby Face Nelson who was one of the most wanted men on the FBI’s list n the 1930’s. My Take on it – This is a film that I wanted to see because from what I personally know of Mickey Rooney’s career it seemed quite surprising and actually humorous that he would be cast in such a role. The fact that he does a great job with the role made this film even more interesting to watch since I expected it to not work as well as it actually does. His own “baby-face” helps make his characterization of this criminal seem even more realistic. This is further proof that sometimes actors who are cast completely against type can excel if giving the right circumstances. The story itself is pretty interesting and we get a clear idea the whole time of the motivations for the actions of the vicious and remorseless character who causes much damage on his way up the ladder of both the crime syndicate and the FBI most wanted list. The film isn’t very long, yet they still manage to give us a pretty complete picture of the life of this very dangerous criminal. This film was considered to be quite violent when it was made, but obviously compared to today’s standards, it comes across as being quite tame in the way that ot portrays some of the vicious and notorious crimes of the gangsters of the 1930’s Chicago. Bottom Line – Interesting portrayal of one of the most infamous gangsters of the 1930’s. They do a great job of showing how brutal he was and we get a clear idea of his motivations the whole time. 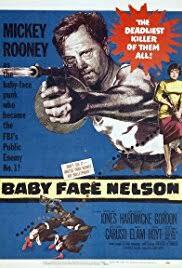 Rooney was seemingly completely miscast in the role of a vicious gangster, but surprisingly, he does a great job with the role especially due to his own “baby face.” For it’s time, this film was considered quite violent, but is actually very tame compared to today’s standards. Recommended!